Requirements were INTRODUCED as a new merit badge effective February 26, 2015. Describe what Morse code is and the various means by which it can be sent. Spell your first name using Morse code. Send or receive a message of six to 10 words using Morse code. Describe what American Sign Language (ASL) is and how it is used today. Spell your first name using American Sign Language. Send or receive a message of six to 10 words using ASL. Spell your first name using semaphore. Send or receive a message of six to 10 words using semaphore. Using illustrations or photographs, identify 10 examples of nautical flags and discuss their importance. Either by sight or by touch, identify the letters of the braille alphabet that spell your name. By sight or touch, decode a braille message at least six words long. Create a message in braille at least six words long, and share this with your counselor. Describe to your counselor six sound-only signals that are in use today. Discuss the pros and cons of using sound signals versus other types of signals. Demonstrate to your counselor six different silent Scout signals. 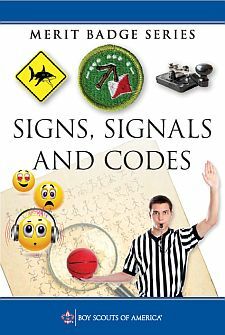 Use these Scout signals to direct the movements and actions of your patrol or troop. Show examples of 10 traffic signs and explain their meaning. Using a topographical map, explain what a map legend is and discuss its importance. Point out 10 map symbols and explain the meaning of each. Discuss text-message symbols and why they are commonly used. Give examples of your favorite 10 text symbols or emoticons. Then see if your counselor or parent can identify the meaning or usage of each symbol.